Microsoft Teams is now out and available to everyone. In case you missed it, the official the announcement is here. What’s really good news for developers is that there are a number of different development options available from day 1. Tabs are a way for you to embed your web content directly into the Teams UI experience. In the screenshot above, notice how the Asana tab has been added directly alongside Conversations, Notes, Files etc. To find out more about adding tabs to Microsoft Teams go to the Getting started with tabs for Microsoft Teams MSDN page. Microsoft Teams is a new channel added to the Microsoft Bot Framework, so anything you’ve already written there can be enabled to work with Teams. There are no additional settings once you’ve added the new channel – it should just work. For more information on writing bots for Microsoft Teams using the Microsoft Bot Framework go to the Creating bots for Microsoft Teams MSDN page. 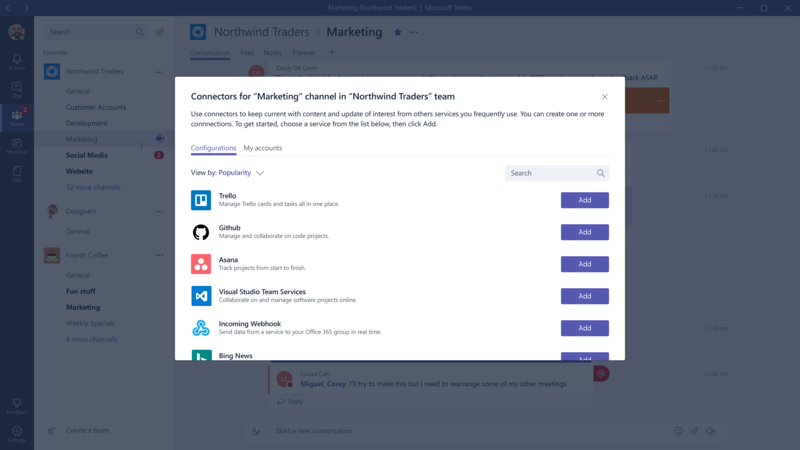 If you want to bring in content from other places into Microsoft Teams, such as branch notifications from GitHub, or build notifications from TFS then Connectors are for you. Connectors allow you to post information into teams. Office 365 Connectors use webhooks to create Connector Card messages within Microsoft Teams. Developers can create these cards by sending an HTTP request with a simple JSON payload to a Microsoft Teams webhook address. To find out more about Connectors and create your own, visit the Getting started with Office 365 Connectors for Microsoft Teams MSDN page. Edit: right not you can’t just create new Connectors for Microsoft Teams. There is a Connectors Developer Dashboard Beta but it’s only for creating Connectors for Office 365 Groups. However, if you think you have a killer idea for a Microsoft Teams Connector then there is a submission page for you to submit your proposal. 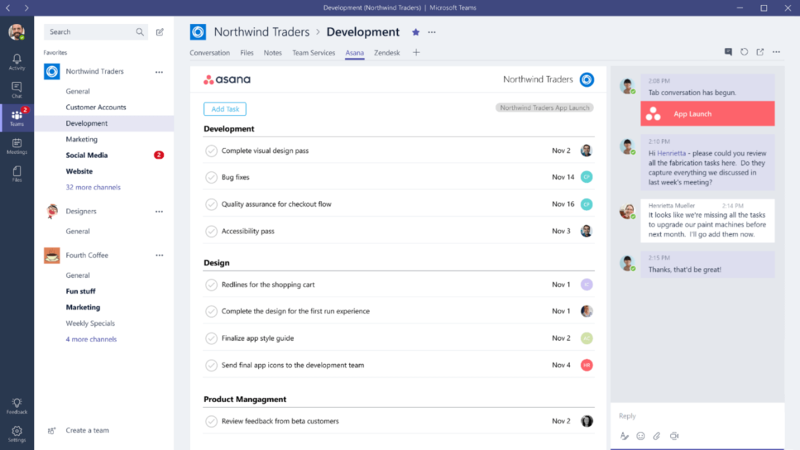 It’s really exciting to see a new product like Microsoft Teams launch with so much support for development integration from day 1. Microsoft are working really hard to make communication a feature which is consumed by applications. To do this, users need to be able to have immediate access to the information they need and the communications tools, together. 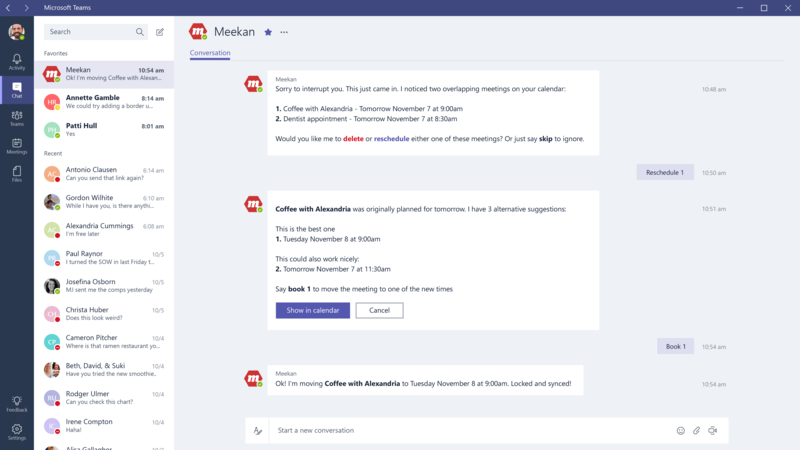 Even from this initial Preview release of Microsoft Teams, it’s clear that this is a product that has this vision front and centre and is enabling users to focus on collaborating to get things done without having to focus on why and how of the technology. It’s going to be really interesting to see how this is received by both users and developers alike. I think that users will love how easy it is to work together and mix document sharing and persistent messaging with immediate voice and video. I think that developers will appreciate the different integration options they have and how they can bring their own data and applications into the Teams ecosystem. It’s going to be a very disruptive next couple of months. Interesting stuff. My understanding is Teams is built on top the consumer Skype framework instead of Skype for Business. Is this correct and do you have any predictions about how this might impact development for Teams and Skype for Business?